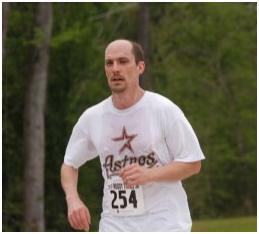 My first 5K was the Muddy Trails 5K in the Woodlands on April 5, 2008. My Dear Hubby signed up with me so we were both pumped and ready to go. Then Saturday got here and we were on our way to the Woodlands. The race winds through the George Mitchell Nature Preserve, which is about 1800 acres of trees. I was starting to get nervous as we turned into the parking lot and started walking toward the check in area. Once we reached check in, Mike and I got our chips (to keep time with), tied them to our shoes, then found a place at the back of the line. My stomach was in knots as we were waiting for the national anthem to be over and the starting gun to sound. I literally thought I was going to be sick. *BOOM* the gun sounded and off went the masses. Mike gave me a kiss for good luck then took off after them. Slowly I began my run, which is more of a jog if you can call it that. Yeah, I was runnin’ (as Forrest would say). I started thinking, “Hey this isn’t so bad. At least I’m not last!” I had two goals for this race 1) to finish under an hour and 2) not to be last. That was it. There were kids placed throughout the trail, some adults as well, cheering you on. Every once in a while they had watering holes you could stop at if need be. I was sailing through this race, no way was this going to take an hour! Ah…but pride cometh before the fall. Around the quarter mile, maybe half mile mark my shin splints came on full force. I started walking, stretched a little bit, then tried to run again. Nope…they weren’t having it. So, I walked the rest of the race. I had told Mike not to come back and get me when he was done. Which I was glad of! The last thing I wanted was him to see me doing so poorly. Slowly but surely I was being passed. I looked behind me and to my disappointment I saw the bike rider. The bike rider is a guy that follows the last racer so everyone knows when the race is finished. That was me…the last racer. Goal #2 not met. About this time I was feeling pretty down on myself. I had run for weeks before the race and figured I’d be able to run the whole thing. The biggest problem was probably the difference between running on a treadmill (or road) and running the Muddy Trails course which was sandy or pine needles. I was ready to just cut through the trees and get back to the end. I just wanted it to be done. Then, I see Mike running around the corner toward me around mile 2. I started crying. I was pissed because he came back and saw how pathetic my attempt was, but I was thankful because he was there for me. He walked with me for the rest of the race. This is Mike trying to make me smile for the photographer at the top of the BIG hill. I love his smile here! He was being a turkey about posing for the camera. The camera guy used up the rest of his film on me I think. He took about 5 or 6 at this point. Once we came down the what seemed the biggest hill in Texas, I could see the finish line. At the finish line, there was a huge clock showing the time that had passed since the gun was shot. It was yelling at me “57 Minutes…only 3 left…move it.” So, I took off running (hobbling) again trying to finish before the clock hit 60 minutes. 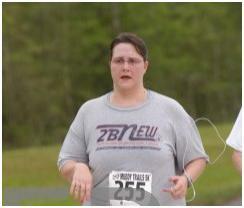 Unfortunately, my left leg was really burning so my finish line picture was less than flattering. I crossed the line as the big clock clicked to 58 minutes and 57 seconds. According to the chip, I finished in 58 minutes and 28 seconds. So, goal #1 was accomplished. I came in 224th out of 224 participants with a total pace of 18:44/M. Once I crossed that finish line I was so happy to be done. They had a crawfish cookout for after the race and the smell was horrible. It made me almost sick to my stomach when the smell first hit me. My sense of smell seems to be heightened when I’m physically tired. Besides, who eats crawfish for breakfast? Mike finished the race in 24 minutes and 35 seconds. Woohoo! He was 44th out of 224 and had a pace of 7:52/M. Mike finishing the first time. Mike smiling as he finished the second time with me. 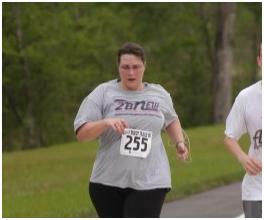 My first 5K was so terrible–I didn’t even blog about it. But they were removing the signs before I crossed the finish line. It gets better (especially when you choose events with bigger crowds). Hang in there! Thanks for your post! I could definitely relate! Running has been quite difficult for me to master this go ’round. 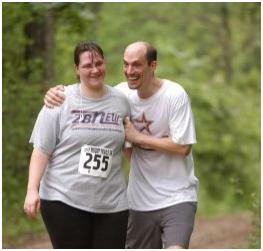 I used to be able to run 1-1 1/2 miles without any problem when I first got married, but of course I was 80 lbs lighter too. But, you’re right…it does get better. 53 lbs?! That’s outstanding! I saw John Bingham’s name mentioned in someone else’s blog yesterday but didn’t pay any attention to him. I think it’s time I checked out what he has to say. 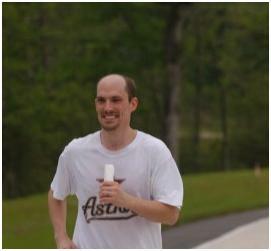 I’ve signed up for the Pearland Pear Run 5K (may 8th) but that’s the last race I’ve signed up for at this point. I usually don’t do many races in a year, especially when we start hitting the temps in June and July. 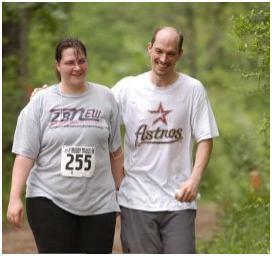 I think a friend of mine may be doing the Minute Maid Park 5K though. I’ll think about it! 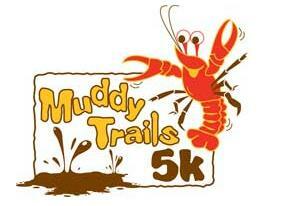 Good luck with this weekend’s 5K. I’m already getting nervous about it! Don’t be nervous! Just go do your thing. I’ll be taking the summer off from running events, too–way too hot. We’re aiming for one per month in the fall. Of course, Race for the Cure is one we love! By the way, I think we live in the same area. Drop me an email if you’d like to together for coffee.